The true horror of the laboratory monkey trade has been uncovered by our field officers and released simultaneously in the UK and USA by the NAVS and ADI USA. Our team infiltrated the secret world of two major dealers operating out of holiday island paradise Mauritius. We released footage from inside the Biodia facilities on Mauritius and Noveprim in Spain. A far cry from the sanitised images that are presented in the media, and used to lobby politicians, our findings expose a world of brutality, fear and suffering, long before the monkeys even start their terrifying journey to the laboratory. Pictured above: A tiny screaming monkey is manhandled at Biodia on Mauritius. Holiday makers and honeymooners are oblivious to the hidden suffering in this tropical paradise. Mauritius is one of the largest suppliers of monkeys for laboratories in the world, sending thousands to miserable deaths each year – some could even be locked in tiny boxes in the cargo hold, next to holidaymakers’ bags as they travel home. Pictured: Noveprim: Monkeys in isolation stare out from a row of bleak hospital cages. Our shocking findings were published in the Sunday Mirror and Mail Online, generating an outpouring of anger from their readers. We quickly followed this with a launch in the US – the world’s biggest user of laboratory monkeys, experimenting on a staggering 70,000 every year and importing some 20,000, some from Mauritius. Jan and Tim appeared on the national show TakePart TV (Pictured) and discussed the use of monkeys in experiments. We then revealed the secret plans of Biodia and their US based partner PreLabs to establish a huge monkey factory farm in Florida with some 3,000 monkeys. ADI USA is campaigning to block the shocking development. Next, we showed that it was the same story at other monkey dealers as we released footage from inside Noveprim’s monkey factory in Spain – a UK Home Office approved supplier. We found the same level of day-to-day suffering as at Biodia, including particularly brutal capture and handling methods and the same painful routine tests to which the Mauritian monkeys had been subjected. Inside the Noveprim hospital wing, we found monkeys that were being treated for injuries as a result of fights in the cramped cages. The conditions were bleak – the monkeys were isolated in tiny cages in a windowless room. 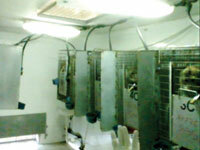 Most monkeys at Biodia and Noveprim are kept in small, crowded gang cages with little to interest the animals. Our investigators were told fights and injuries were common. A stark contrast to their varied life in their lush forest homes. When the time comes for the monkeys to be shipped to animal experimenters around the world, including the UK and USA, they are packed into tiny crates and flown to their fate. This is probably the last time they will ever see daylight. Many airlines have turned their back on this cruel trade, but a few continue to help send thousands of monkeys each year to their deaths. One of the major airlines involved in the trade is Air France which, according to a senior Biodia staff member, “can take a pallet of 80 animals” and continues to fly monkeys from Mauritius. Pictured: Noveprim: Fear and dread – monkeys are restrained by their arms, one screams in fear. 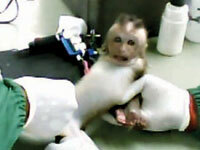 In the laboratory these animals, many only about two years old, will be subjected to procedures such as drug testing where they will be forced to inhale substances, or have them pumped directly into their stomachs; and brain tests where they may have bolts and electrodes implanted into their heads. As witnessed during our investigation of Huntington Life Sciences a few years ago, the stress of being restrained during frightening procedures is so great that it can cause rectal prolapse; tests caused vomiting, blocked lungs, collapse, self-mutilation and death. The UK is the biggest monkey user in Europe, conducting tests on about 2,000 monkeys each year – with almost 1,000 from Mauritius alone. Monkeys from overseas breeders can be kept in conditions that are illegal in this country. Our investigation of Vietnamese monkey supplier Nafovanny revealed that Home Office inspectors were simply directed away from areas of concern – despite that we had supplied photographs of the conditions; meanwhile, MPs continued to be assured of effective inspections. The Government has now told the NAVS that it is unable to set standards for foreign suppliers. Pictured: Biodia: A tiny baby monkey is torn screaming from his mother and then, whilst fully conscious, given a huge identification tattoo. After an intense campaign by the NAVS and ADI, the European Parliament made a Declaration to end the use of monkeys captured from the wild and restrict experiments on monkeys. This was reflected in the European Directive on animal experiments. However, implementing the rules that will prevent the dealers restocking their factory farms from the wild has been unacceptably slow. The first step towards this is a feasibility study to be published no later than 10th November 2017, with certain species phased out 5 years after this date. We must continue to push hard for this to be implemented as soon as possible. Please send a donation today to help us keep exposing animal suffering and work to end this trade. Contact Air France-KLM by post to tell them that you will be flying with other airlines until they stop transporting primates for research – write to Alexandre de Juniac, CEO, Air France-KLM, 10-14 Rue de Rome, 93290 Tremblay en France, Paris, France. Contact your MP and contact your MEP and urge them to support a phase-out of the use of primates in research.